Under the dome of the northern wing of Sofia University is situated a museum that throws light into the darkness of the distant geological ages. The Museum of Paleontology and Historical Geology houses in its collection and exposition more than 200 000 fossil specimens, rock samples, and geological maps of Bulgaria and the neighbouring territories. The foundations of the Museum of Paleontology and Historical Geology were laid down by the renowned Bulgarian geologist Prof. Georgi Zlatarski with the compilation of the first paleontological collection at the end of 19th century. For educational purposes, at the beginning of the 20th century, were bought the highly valuable and rich collections of Krantz, Alexander, and the so called Czech and Swiss collections. Subsequently, Prof. Petar Bakalov and Prof. Vasil Tzankov contributed greatly for the prosperity of the museum. In the time leading up to now this vast (more than 150 000 specimens) collection has been steadily filling up with new material collected during the scientific work of various lecturers, specialists, and geology students from Sofia University, as well as the numerous groups that have been mapping the territory of Bulgaria. The museum is a center for conservation and exposition of the micro and macrofossils investigated in numerous published works, dating back from the turn of the last century. Of high scientific and national value are the exhibited unique specimens (holotypes) of new for the science species and genera, determined for the first time by Bulgarian paleontologists. The most spectacular example of these is the restored and perfectly preserved (more than 90%) skeleton of Deinotherium thraciensis Nikolov, which apart from being unique is also fascinating by its size exhibit. It is a very interesting branch in the evolutionary tree of the Proboscidea, because he had downward curving tusks attached to the lower jaw. It was discovered in 1965 at the vicinity of the village of Ezerovo (Plovdiv district) by Dimitar Kovachev – a teacher of biology from the town of Asenovgrad, together with his scholars. It is restored by Prof. Ivan Nikolov for seven years, and is the best-preserved skeleton on this prehistoric animal in the world. He lived 10 million years ago, and it is considered that it was an adult specimen (around 45 years old) with impressive dimensions – almost 7 m in length and 4.2 m in height. The exhibiting area consists of two spacious premises; a central lobby and a museum hall. The museum’s depot houses a rich fund (approximately 150 000 items) of unpublished and unexhibited material. There are more than 50 000 fossil invertebrates and plants, prepared and published by Bulgarian scientists in the years between the end of the 19th century and today. The Paleontological exhibit features specimens of fossil flora (petrified plants), fossil protists (foraminifera and other microorganisms), and fossil animals (invertebrates and vertebrates). In the museum hall is stored the biggest invertebrate fossil collection in Bulgaria, comprising varied ammonites, belemnites, gastropods, bivalves, corals, echinoids. The museum contains also a collection of geological maps of Bulgaria, the biggest one in our country. 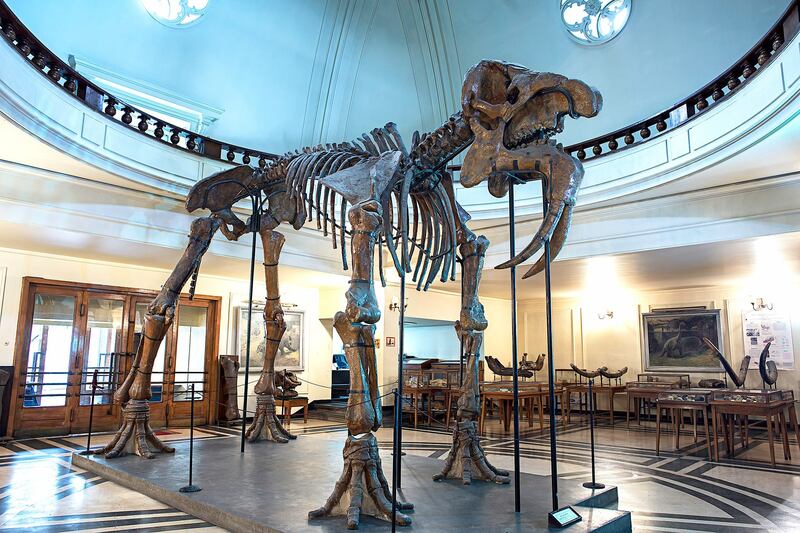 In 1996, as a branch of the Museum of Paleontology and Historical Geology at Sofia University “St. 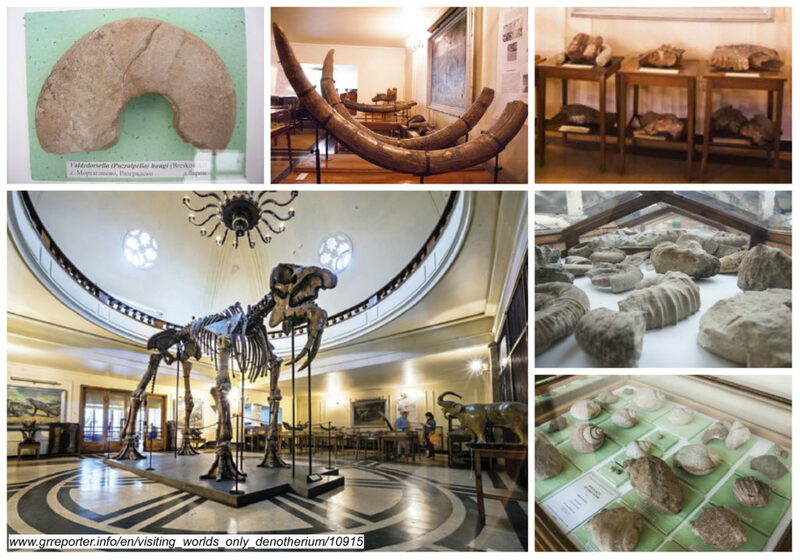 Kliment Ohridski”, opened doors the regional Museum of Paleontology in the town of Elena. Its collection exhibits the fossil contents of the Lower Cretaceous Series in northern Bulgaria.